Turmeric’s rich healing properties have been a common knowledge in Indian terra firma. Since time immemorial a glass of haldi doodh or turmeric milk has been a common go-to drink for healing injuries, or boosting immunity. It has found its way in the traditional skin care rituals too. According to the book, ‘The Flavour of Spice’ by Marryam H Reshi, “turmeric, or curcuma longa, is native to South India, where hot, humid summers and plentiful rains together with loamy soil provide the ideal conditions for its growth. Turmeric is now grown in 22 states of the country.” Turmeric is indeed a staple part of ever Indian kitchen. Across India, turmeric is used extensively in a variety of culinary preparations. Infusing the vibrant yellow tinge to the dullest of our dishes, turmeric is one spice we just cannot do without. There are plenty of reasons why you should join the fan club too. Turmeric is packed with strong antioxidant, anti-mutagenic and anti-inflammatory properties. Ayurveda’s precious turmeric is replete with anti-viral and antibacterial substances like lipopolysaccharide that help boost immunity. Curcumin present in turmeric is said to trigger bile production, which is one of the main components of digestion. Increased secretion of bile juice helps facilitate smoother digestion through the tracts. Its ability to aid digestion and detox properties make turmeric a superfood for weight loss too. Turmeric’s anti-inflammatory properties also help in relieving symptoms associated with both rheumatoid arthritis and osteoarthritis. The umpteen antioxidants present in turmeric can help curb the free radical activity. Experts believe that curcumin may help delay the onset of type-2 diabetes in people with pre-diabetes. It further helps moderate insulin levels and boosts the effect of medications that treat diabetes. One of the most common ways to make most of turmeric’s nutrition is of course the good old haldi doodh. But for those who are not so much in favour of milk, can use the goodness of turmeric to prepare hearty turmeric soup too. The monsoons are here. The damp weather also makes one susceptible to several diseases associated with the monsoon season like cold and flu, throat infections and tummy problems. Consumption of turmeric soup provides with maximum inflow of vitamins and also helps in keeping the body hydrated. The flavourful additions of garlic, onions, and ginger would further help you keep warm in this nippy weather. 1. Take a large stock pot, and heat about a tablespoon of olive oil in it. Make sure you do not overheat it. 2. Add the diced onions into the pot and sauté them well. After about two minutes, add garlic, turmeric and ginger and sauté the ingredients well for another two minute. 3. Next, add the carrots and sauté for another two minutes. 4. Now slowly add the vegetable stock to the pot and let it simmer for about 20 minutes. 5. With the help of a blender, give the broth a nice blend. Check the carrots, see if they are soft. 6. Serve the soup piping hot. 7. You can squeeze a bit of lemon on top of the soup before serving. 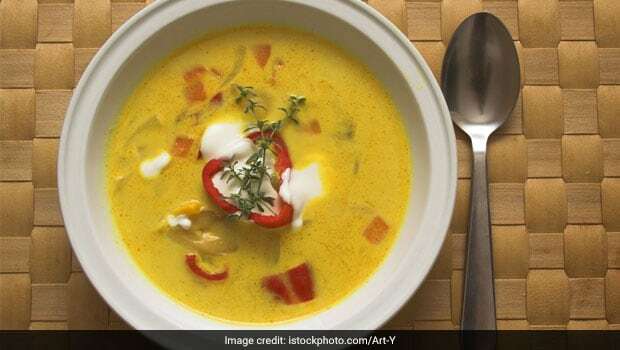 Follow this simple recipe and treat yourself with this delicious turmeric soup this monsoon.